Nostradamus predicted a 9.8 earthquake to hit the state of California on May 28, 2015; He was off by a day because San Andreas the movie opens in theaters tomorrow. With the massive destruction that happens in the movie, he couldn’t have seen it coming. Not only will it hit California, this is going world-wide. San Andreas will leave you trembling. Director Brad Peyton reunites with Dwayne Johnson in San Andreas, where he plays Ray Gaines, a LAFD search and rescue helicopter pilot. After the first initial earthquakes in Los Angeles, Ray and his estranged wife Emma, played by Carla Gugino, set out to rescue their daughter who is 400 miles away. Blake, played by Alexandra Daddario is in San Francisco trying to find her way to her parents. We caught up with the cast where they talked about their personal experiences with disasters, natural vs. man-made. What kind of real world impact do you think the Nepal earthquake, will or will not have on San Andreas the movie? 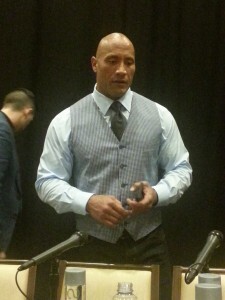 Dwayne Johnson: Great question to kick this thing off! We made the movie knowing and understanding the content of it, what we were making, what we live in, life today, these things happen. So unfortunate, prayers and thoughts continue to go out to everybody, everybody that was affected by that. The truth is you go into a project like this with everything you got in your soul. You just want to make a good movie. You understand the content of it but I think if there is one co-relating factor or connective tissue, if you will, it would be the ideology of family and strength come together through a tragedy like this. I’ve been through natural disasters. I’ve lived down in Miami for hurricane Andrew, which was a category five. Had members of my family think they were going to die in a bathtub. It was a tough thing so I think the idea of coming together like we were showcasing in our story resonates with people. And I think if there is any connection it would be that. Brad Peyton: The good thing about making this kind of movie is bringing awareness through entertainment to handle this type of thing… there is some positivity in doing a movie like this. If you were in an earthquake, or any kind of emergency, what would you do out side of your status as an actor/movie star? Alexandra Daddario: The first thing I thought of when I was auditioning and I got this job was [how] I grew up in New York city, and I was in Manhattan during 9/11. That was really the only thing that I sort of related to as far as disasters on the grand scale. And it was really interesting to see on that day and afterwards how people came together and what they were able to do for each other. And what I found myself doing and thinking. I really related [to the movie] in that way. It was an experience you can’t fake. Carla Gugino: I was also thinking the same thing because I was in New York when 9/11 and I use to be able to see the towers from my apartment. By the time I got the call of what was going on one tower had gone down and then the other one shortly after… These moments as we know, mother nature is incredibly powerful and that is one thing. In [9/11] case it was caused by a different reason. But there is something in these moments that is really extra ordinary about humanity…The whole experience was absolutely life changing. San Andreas is in theaters today May 29th.